Andy Shaw received his Master of Fine Arts from the New York State College of Ceramic Art at Alfred University, Alfred, NY in 2000. Since that time he has firmly established himself as one of the best young potters in the United States. Shaw’s work celebrates function. 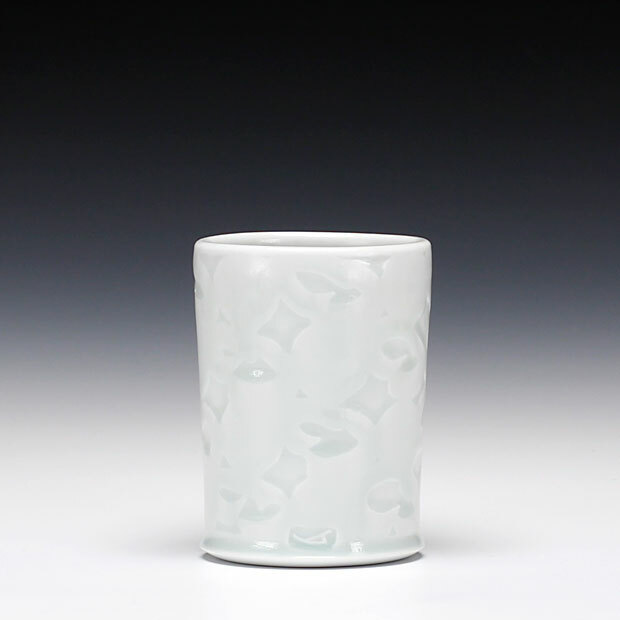 It is meticulously crafted with beautifully proportioned forms and simply textured patterned surfaces highlighted through the pooling of a softly colored glaze. "Your relationship to objects is selective, personal; only the things you feel yours become yours; it is a relationship with the physicality of things, not with an intellectual or affective idea that takes the place of seeing them and touching them. And once they are attached to you, marked by your possession, the objects no longer seem to be there by chance, they assume meaning as elements of a discourse…"
I have an idea for a play, or at least for the format of one, in which human actors are replaced by empty costumes set among the other necessary theatrical props. Aside from lighting changes and scene dialogue read from the wings, there is no other activity onstage. Early innovators in motion studies discovered persistence of vision, in which the brain briefly retains flashed still images. Utilizing this phenomenon to develop the perception of motion, they would show a sequence of images knowing that the brain would fill in the time gaps between each frame. I would apply an interpretation of this discovery to the play to see whether the dramatic dialogue can bring life to the vacancy in the costumes through the perception and imagination of the audience. In my pottery, I examine this format of vacancy and the tenuous balance it requires of the viewer-participant in establishing completion. Knowing that the porcelain will become active components within someone’s home, I design each piece so that it can adapt to place and to the personal preferences of the homeowner. In my studio I resist the artistic impulse to create overall resolution and completion, opting instead to leave room for improvisation by the cook whose own need for creative resolution is just as necessary as mine. By leaving the glaze color neutral, cooks recognize the invitation for a spinach, strawberry and almond salad or perhaps for a grilled turkey club panini with purple onion. In this way, color is not a fixed quality in the pottery, allowing it to have an active role in daily kitchen creations. Paring the tableware down for utilitarian needs, the round forms develop consistency within a dinner set while the patterns, variations of lines and grids, offer individual distinction while maintaining the unity of the set. Patterns extend to the rims of plates and seemingly beyond to interact with the incidental, linear, domestic patterns present in shadows and in the architectural elements of wooden floors and stair railings. My patterns respond to contemporary home design trends while bridging to the pliability of handcrafted textiles. The generalized character of the patterns allow the porcelain to adapt to place easily, becoming a complement to a diversity of existing home designs. In order for a pot to be functional it must be used. As the potter I design the porcelain with opportunities for the addition of color and the complement of other objects and patterns as an invitation to the homeowner to incorporate the porcelain into their active home lifestyle. These purposefully designed thematic openings promote substantial connections between the pottery and its audience by drawing out practical and aesthetic utility within an advocacy for creative living.